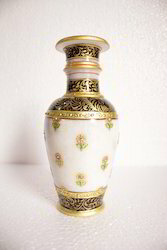 We offer Marble Flower Vase in various sizes. 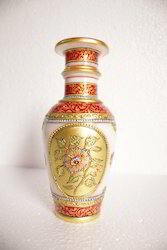 This is 9" Vase with fine gold artistic work and nice finishing. There is 1 gold boota in this design. We make in many other colour combinations and good shining. It can be placed on centre table or side table for a classic dacoration. We offer Marble Flower pots in various sizes. 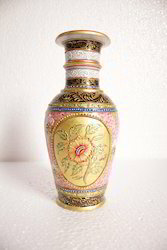 This is 9" Vase with fine gold artistic work and nice finishing. We make in many other colour combinations and good shining. It can be placed on centre table or side table for a classic dacoration. In case one wants to look for the best artifacts ever for gifting purposes, then Alka Creations is the name to rely upon. 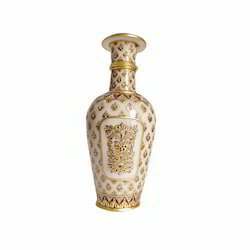 There are different types of products that we have in store for you and among all the products the Marble Vase with Gold Work deserves special mention. This product is also known for their rugged design, high tensile strength and also longer working capacity. 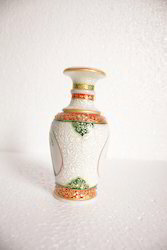 We are the leading manufacturers and suppliers of Traditional Marble Vase. Using premium quality marbles and advance techniques we design these vases. These are used to add decor to home, restaurants and hotels. Our team of professional designers supervises the manufacturing process of these products. Available in various sizes and design, our clients can purchase these from us at market leading rates. 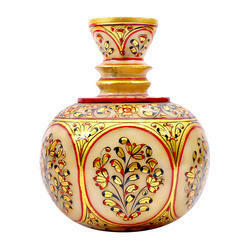 After years of experience in this field, we are able to manufacture high end Meenakari Work Vase that is well crafted with quality products and services for our wide range of qualified customers. These are made using some of the quality raw materials and these are procured from reliable vendors. Users can get these from us at cost effective ranges and without having any problem with it. We are the most trusted name engaged in offering top grade StylishVase that are made under the expert guidance of leaders who are related with this field for some years now. 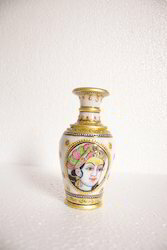 This product is going to work as an artifact and at the same time ne can decorate their flowers inside this vase which is again well decorated with golden touches and bright colors. 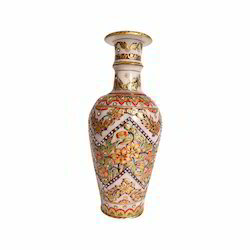 With the help of our leading designer and manufacturing units, we are able to supply our wide range of customers with quality Traditional Vase that is truly a marvelous creation of mankind. 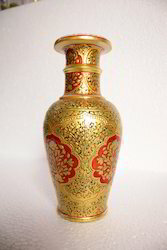 This vase is entirely decorated with small design rots which are made using real gold texture. The intricate design in the middle is surely a great surprise for all. 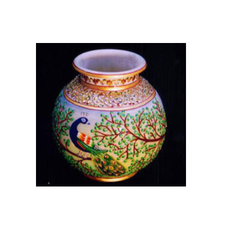 After years of experience in this field, we are able to manufacture and supply high end Meenakari Work Vase that is too good to resist. 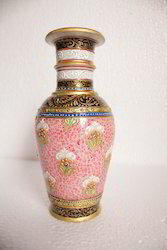 We are able to manufacture top grade vases that are decorated with multicolored stones and painting imprinted on >it. These are surely going to enhance the whole look of the house and also will make everyone crave for more. We are notable in the field dealing with manufacturing, supplying and exporting high end marble artifacts which are beautiful and at the same time long lasting. 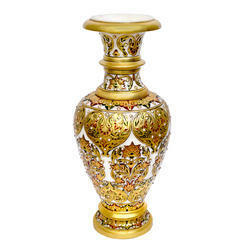 This product, namely Gold Work Vase is beauty at its best. 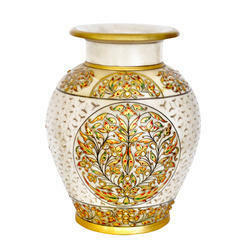 This vase is designed with flowers on gold base which makes it all the more ravishing and beautiful. This can be availed from us at cost effective ranges. 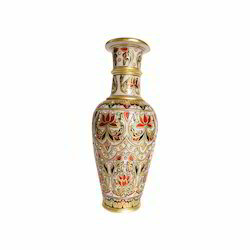 Well known for our leading manufacturing unit, we are able to provide our customers with top quality Vase with Gold Work that is well decorated with new designs and bright vibrant colors. These vases are available in different shapes, sizes and colors, depending on the mood of the customers. These are mainly used to match up the different requirement of the clients. We are also capable of providing these at market leading ranges. 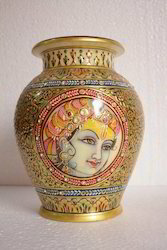 Owing to our experts experience in this domain we are successful in manufacturing and supplying an extensive range of Indian Vase. These lotas are beautifully designed with the images of Radha and Krishna. These are available in various sizes and designs. These decorative work pieces are used for adding décor to the interior id homes, hotel and restaurants. Our clients can avail these from us at market leading rates. Our high reliable service and customer servicing team has made us a well known name in this market. We are able to manufacture high end products for our customers who have full faith in us. Our world class raw materials along with high end machines are noted for creating some well defined Marble Vase that can last for a longer period for time. You can always ask for something which will make your artifacts different from others. 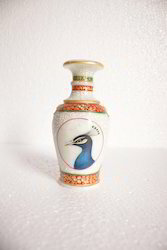 Keeping the different moods of our customers in mind, we are able to manufacture and supply a wide range of Peacock Design Vase that is all the more mesmerizing and beautiful due to the golden touch in it. This piece is surely going to blow your mind off. 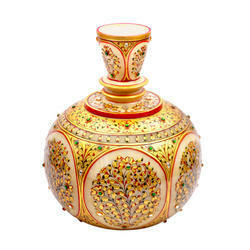 We are one of the major manufacturers and suppliers of Crafted Marble Vase. These are made using excellent quality raw materials. These are applicable for decorating homes, hotels and restaurants. These are beautifully designed under the guidance of our professional designers. These are valuable in various sizes and designs. Our clients can avail these from us at affordable price range. Known for its fine sheen and quality results, our Marble Vase is gaining more and more popularity with every passing day. This product is really beautiful and more than that, durable so that it can last for a longer period of time. Users can wash this marble artifact with clean water in order to regain its shine and glossy texture. The prints on it will not get damaged due to this. 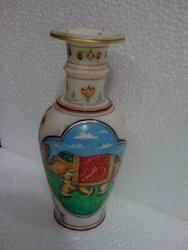 Marble Vase with Queen can be the ideal choice for those who want to add an aristocratic feel to their household. This product got some class in it which can only be felt after purchasing it. The golden base is truly amazing and at the same time, jaw dropping for many customers. Using top notch raw materials, these products are used under the expert guidance of our team of professionals. 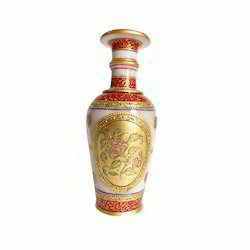 We are the leading manufacturers and exporters of premium quality Vase with Elephant that is made out of high end marble products and other important raw materials. These are intricately decorated with a big picture of an elephant that is made using various important and bright color combinations. These are known for their glossy texture and smooth finish and these can be availed from us at cost effective ranges. 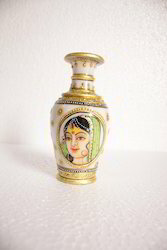 For a great and significant gift item, one can readily choose for the Lota Vase with Taj Mahal that is well decorated with gold designer base and other features. The Taj Mahal is truly amazing and the marble base makes it all the more beautiful and ravishing. These are made at par with the international market level and available at reasonable rates. We are providing our clients with quality marble products for years now and among all our products, the Marble Lota Pot deserves special mention. 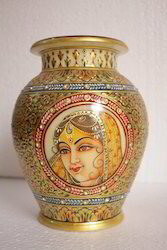 The flower design is surrounding the whole body of the Lota pot and it is made using real golden touch ups in order to provide a royal look to the whole piece. This comes with a lid which will make it all the more popular among the masses. For those who want to experiment with style and design, this Marble Lota Pot can be the best ever option available near hand. 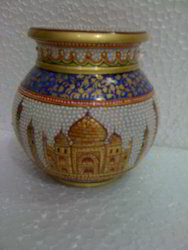 This product is nicely engraved with the picture of Taj Mahal which is the symbol of pure love and affection. 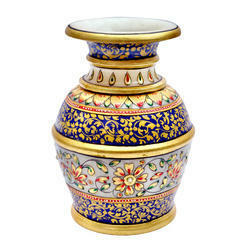 This is made using golden touches along with a blue cover on the top, which enhances the beauty of the Pot more. We are noted for providing our clients with a beautiful and elegant looking Marble Pots which are well decorated with various important decorative materials. These are made using high end quality raw materials that are procured from reliable vendors associated with our field for some years now. These are quite durable and at the same time weather resistant. These are great interior decorative products and these comprises of real gold, color tones which are natural and also various other elements. 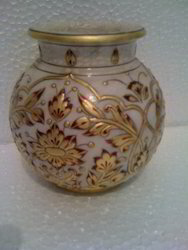 We are offering our clients with quality Marble Pots with Lid that is well decorated with gold works on it to give it an aristocratic look. These pots have their own matching lid which works like an additional bonus point. It can be used as decorative item for anywhere and can also be the best gift ever. These are made using finest quality marble that is available in the market. 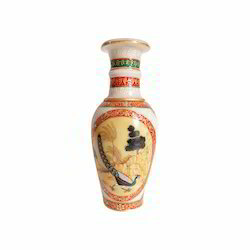 Well known for our leading manufacturing unit, we are able to provide our customers with top quality Vase with Traditional Design that is well decorated with new designs and bright vibrant colors. These vases are available in different shapes, sizes and colors, depending on the mood of the customers. These are mainly used to match up the different requirement of the clients. We are also capable of providing these at market leading ranges. We are providing our clients with a wide range of Vase with Traditional Design on it that is quite beautiful and will also help you to make your peers go green with jealousy. This product is not only handy but can be used quite easily without facing any problem. This is tested on different parameters in order to check the credibility and durability of the product. 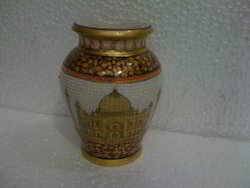 We are one of the leading manufacturers and suppliers of top grade Marble Pot With Fine Gold Work for an elite look to the whole piece. The Fine Gold Work is making the piece even more stunning and beautiful. Some major features are durability, high tensile strength and fine finish. 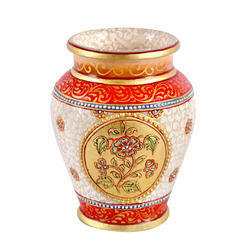 We are one of the leading manufacturers and suppliers of top grade Marble Pot With Flower Print for an elite look to the whole piece. 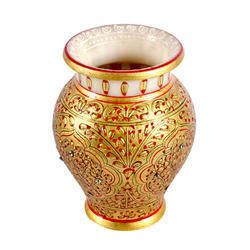 We are one of the leading manufacturers and suppliers of top grade Vase with Fine Gold Work for an elite look to the whole piece. We are one of the leading manufacturers and suppliers of top grade Marble Surahi With Fine Gold Work for an elite look to the whole piece. The lovely light pink color is making the piece even more stunning and beautiful. Some major features are durability, high tensile strength and fine finish. We are one of the leading manufacturers and suppliers of top grade Marble Surahi With Fine Gold Work With Box for an elite look to the whole piece. The lovely Fine Gold Work is making the piece even more stunning and beautiful. We are one of the leading manufacturers and suppliers of top grade Marble Pot With Work for an elite look to the whole piece. The Work is making the piece even more stunning and beautiful. Some major features are durability, high tensile strength and fine finish.